Compliance reporting features include: SARA 313 Form R (EPCRA), SARA 312 (Tier II), VOC and HAP Emission Reports, RCRA Biennial and Annual Reports, Uniform Hazardous Waste Manifests and Shipping Lists, Land Disposal Restriction Notification Forms, Container Packing Lists, Waste Container Labels, PCB Annual Report, Title V Annual Air Emission Inventory, Discharge Monitoring Report (DMR), OSHA Reporting, and more. 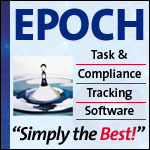 Reduce people time spent gathering data since EPOCH can interface to a variety of in-house systems. Improve data quality due to these electronic data feeds (minimizing manual data entry). Less time spent preparing regulatory reports, such as, Tier II, SARA 313, RCRA Biennial, etc., since they are generated by EPOCH. Minimize or eliminate Notices of Violation by tracking permit conditions on a more timely basis. Reduce or eliminate outside consulting expenses for preparing monthly, quarterly or annual regulatory compliance reports. Control costs further by purchasing only the EPOCH modules of interest. EPOCH software is a complete EHS system for Environmental Compliance Data and Task Management designed to start giving you benefits from day one.